This is a very basic guide intended to help those new to encoding. This guide will work for various file types; DIVX & XVID compressed AVI’s, MPG/WMV/MOV formats. In order to convert to DVD, the free version of tmpgenc will not work, as it only supports mpeg-1 (VCD) encoding.You will need the full version TMPGenc Plus. used and not adjusting the bitrate. STEP 1: Before you load the AVI, check the framerate. This step is critical to ensure a smooth playback. compressor installed, and I suggest the AC3 filter for playback. NOTE: If your avi with AC3 audio crashes TMPGenc, Use "AC3FIX" to correct it. TMPGEnc (and several other programs) are very finicky about correct AC3 headers - and it seems that most XVID-AC3 files do NOT have the "perfect" AC3 headers. Another option is to change the audio to a .WAV file using Virtualdub. Load the file. Go to "video">Direct stream copy. Under "audio">full processing mode, Click "audio" again. click Conversion check 48,000Hz and check "high quality" and ok. Go to "audio" >compression, select "no compression" (PCM) and ok. Finally go to FILE> save WAV. this will produce a .wav file (audio only). You will use this as the audio input for TMPGenc. see screenshots below. Finally, the method I use is to keep the AC3 audio unchanged when making a DVD. 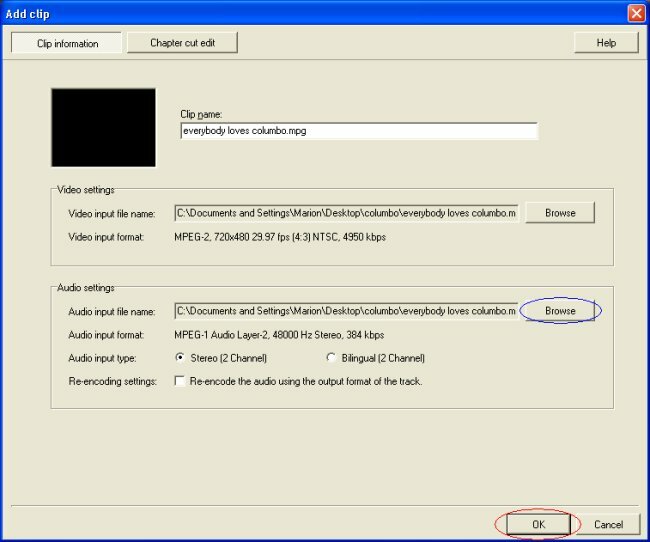 I use the wav file method outlined above as the audio input, sort of like a “dummy” file, for the mpeg-2 conversion, but when I AUTHOR the encoded file I use DEMUXED AC3 audio from Virtualdubmod as my audio source in TMPGenc DVD Author. Authoring a DVD with TMPgenc DVD author (different than TMPgenc plus) is the second and final step to making a DVD. If your file has mpeg-1 layer 3 audio no conversions are needed to satisfy TMPGenc. There you see a list of various reader plugins installed for the TMPGEnc. The one that's called DirectShow Multimedia File Reader is the one that we're looking at. As a default, its priority is -1. Select the item and right click on it. Choose Higher priority and repeat this until the "Priority" for this item is higher than any other plugin's priority in the list (usually 2). LEAVE this set always. I have found 50% of files won’t even open or produce write stream errros unless this is set. MOVIE(ONLY If source file is 23 fps!) otherwise leave alone! and under encode mode, 3.2 pulldown when playback. Leave the rest. same apect ratio. SELECT inverse telecine, or your file will have horribly “jerky” playback. AUTHOR with TMPGenc DVD author. want to encode multiple files in a row, say overnight, which I find to be an excellent feature. corrected by using some of the more advanced features, which I won’t get into in this guide. So if all looks good, you’re ready to AUTHOR and finally burn to a disc! Open TMPGenc DVD Author, click "create new project". click "add FILE". Find your encoded file that you made with the other tmpgenc program, load it. This screen will pop up, click ok. NOTE: The blue circle indicates where you would load Demuxed AC3 audio from virtualdubMod (optional, but the method i prefer). How to Demux the AC3 is explained at the end of this guide. Now at the very top of screen "create menu" here you can experiment and play to see what background you want, layout, titles, fonts, text style etc. Some experimentation is useful here. I suggest going to the top right and clicking "options" and help section, to learn more about the settings of this program and menu features. There are nice guides that are very easy to understand. For this guide i'm choosing a default background image only. To the far left you see one file on one track, if you wanted to join 2 files together, you would simply click "add file" again, NOT "add new track". Adding a new track will create completely seperate file(s) on the final product and would be used when say, you have 2 different TV shows for example. Here under "first play action" I like my DVD to show the menu, and allow me when to choose when the video starts so i have "display main menu" chosen. Also adjust the settings you prefer under "menu display settings". When your satisfied with all of your settings here, at the top right go to "output" and check "create dvd folder" under "output settings", then click "begin output". That's really all there is to it. You will end up with a folder containing a video ts and audio ts folder. The audio ts folder will be empty as it should be. The main folder containg the audio and video ts folders can be given a name, and IT, used to burn with NERO or whatever you use to burn. I suggest playing back the final product on the PC with media player classic to see how everything looks, and using a re-writable disc untill you are comfortable with this program to avoid mistakes and wasted discs. Open VirtualDubMod, under FILE, load your original avi file. Go to "STREAMS", then "stream list". You will see this screen. Click "demux" and save with a name. 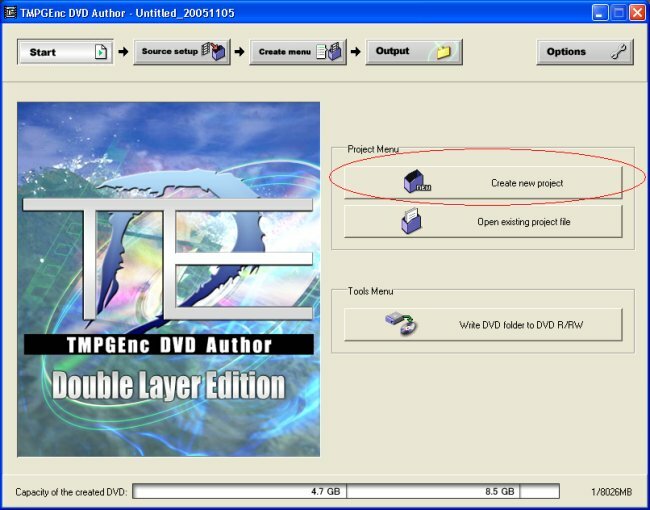 This will give you an AC3 audio file that can be used as the audio input for TMPGenc DVD author as shown on the screenshot above by the BLUE CIRCLE. NOTE: As mentioned earlier, you may find the AC3 won't be accepted when you try to load it in DVD author as the audio source, but can easily be fixed in a couple minutes with "AC3fix" as mentioned at the very start of this guide.